Ever since he was exposed as the actual Hobgoblin by Roger Stern and Ron Frenz during the Hobgoblin Lives miniseries in the late 1990s, Roderick Kingsley has remained a somewhat unmined source of stories for comic book creators. Sure, there was the Hobgoblin Lives follow-up, “Goblins at the Gate,” and the character was re-imagined as one who franchises supervillain identities by Dan Slott during the run-up to Amazing Spider-Man #700. But few have attempted what Kevin Shinick and Javier Rodriquez basically do in the first part of their Axis: Hobgoblin miniseries: spend more than a minute in Kingsley’s world and attempt to tell a story that’s mainly about him. As a result of this negligence – or maybe it’s just a sign of ambivalence – I have developed this weird connection to Kingsley as a reader. I’m far more interested in the twisted, behind-the-scenes drama that fueled the Hobgoblin’s initial reveal as Ned Leeds (and the subsequent retcons from Stern and Co.), because there are very few definitive stories about Kingsley the character. Fortunately, as someone who loves himself some Hobgoblin, Shinick and Rodriquez are on track to let me have my cake and eat it too. 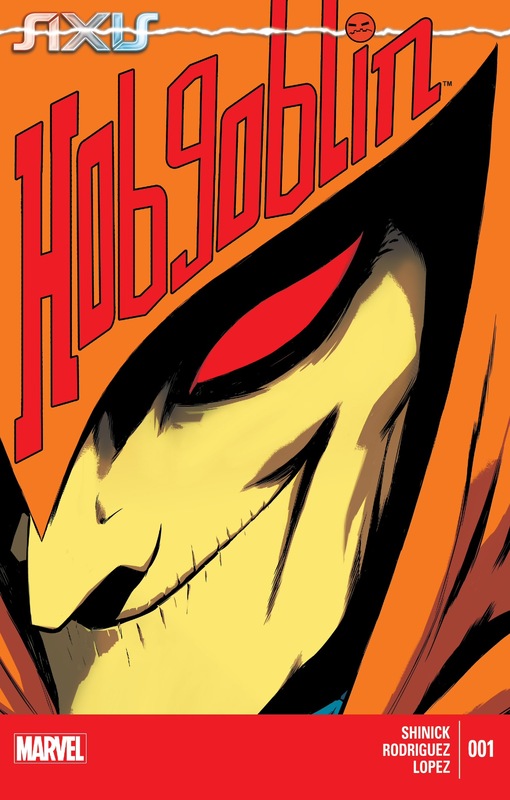 As the title aptly states, Axis: Hobgoblin is a miniseries that is all about the Hobgoblin and his recent turn of character thanks to the Marvel Universe-wide “inversion” of heroes and villains. But more importantly, it’s a story that really starts to peel back some layers from Kingsley, producing a first issue that’s clever, funny and engaging. Shinick’s ability to mine quality stories from some of the more niche corners of the Spider-Man universe (his Superior Carnage mini last year remains my favorite Carnage book in years, and his “Goblin Nation” tie-in issues of Superior Spider-Man Team-Up earlier this year were probably the best part of the arc) continues to impress me. As I alluded to a few paragraphs earlier, there just isn’t a whole love of Kingsley content out there for creators to tackle an entire miniseries that focuses on the character when he’s not perched upon a Goblin Glider, tossing pumpkin bombs at Spider-Man. 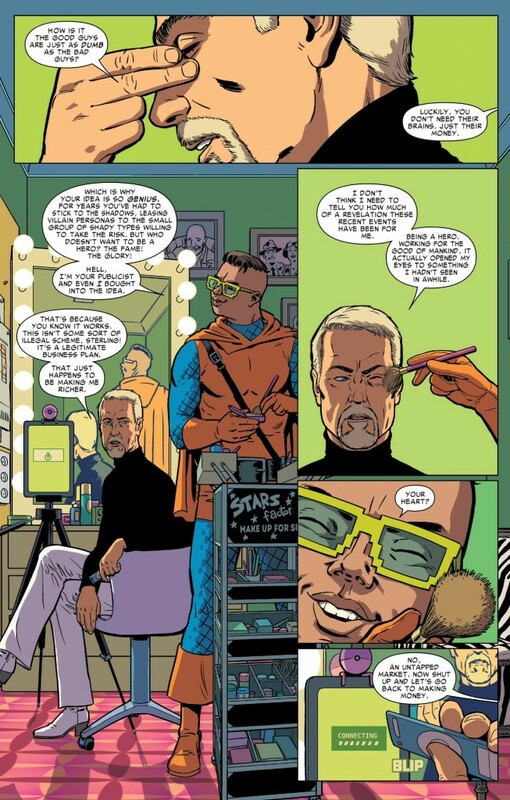 As such, Shinick actually has carte blanche to do what he wants with Kingsley – especially when you consider the fact the general premise of Axis is that a number of longtime villains are now acting out of character. And yet, there is something that’s simultaneously new and exciting and reverential to the past in the way Shinick writes his Kingsley. There are subtle homages to the character very first appearances in Spectacular Spider-Man (when the character came across as more of a fashion industry stereotype than a potential supervillain), but Shinick also clearly wants to have fun with this book. And boy is this book fun. So rather than franchise out supervillain identities to the poor and desperate, this new and morally improved Hobgoblin is setting up his customers as superheroes. If this plot point rings somewhat familiar with what Nick Spencer and Steve Lieber are currently doing in Superior Foes of Spider-Man with Spidey’s “D” list villains, it should. And like Superior Foes, Shinick’s narrative bounces along, and is smile-inducing with its quick wit and humor. 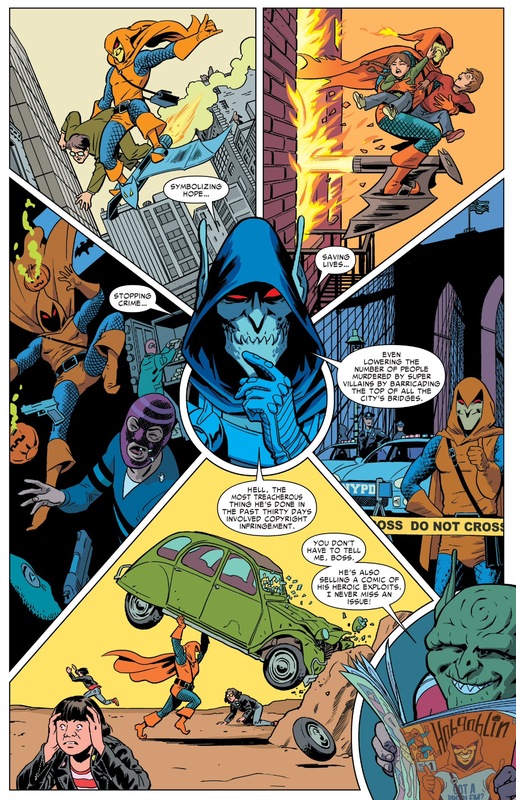 Granted, it’s not quite as meta and visually-oriented as Superior Foes, but Axis: Hobgoblin certainly lampoons a fair number of people and targets along the way. 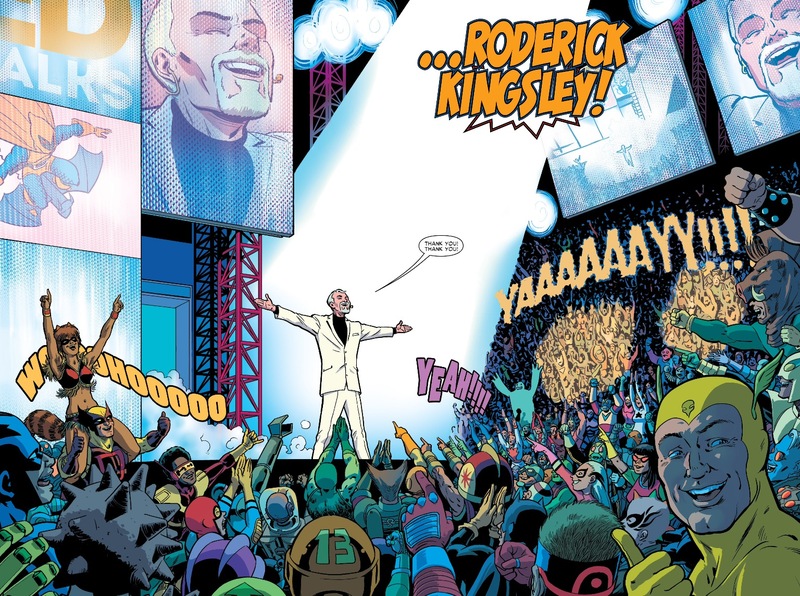 Crafting Kingsley as a post-modern televangelist/motivational speaker of sorts, who goes up on the stage and talks in corporate-speak like “brands are forever,” is a wonderful spin on the character. There’s something inherently sleazy about what Kingsley is doing (preying on those who are compelled to be rebranded as “heroes”), but his motivations/incentives are presented in such a way where maybe he’s doing it for noble reasons (beyond the money Kingsley is sure to make). Lest we forget that a trademark of Kingsley’s over the years is that he’s a master of survival – `, or finding some poor saps like Ned Leeds or Lefty Donovan (who gets a shout out in this issue), to take the fall for him as the Hobgoblin. 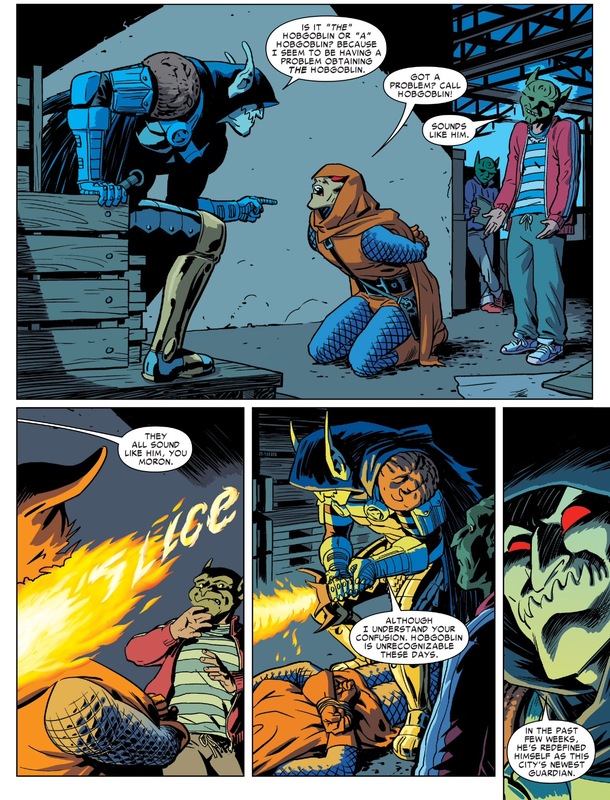 Axis: Hobgoblin demonstrates that even as the Marvel Universe is undergoing some kind of wacky “freaky Friday” spell, Kingsley has the cunning and know-how to come out on top. The story also incorporates more recent stories, including the presence of Phil Urich (aka, the Goblin Knight during “Goblin Nation”), and Lilly Hollister, who were both fighting against Kingsley when the character last appeared in Superior Spider-Man earlier this year. There was some criticism levied against this subplot by others, but it doesn’t bother me in the least. A superhero comic needs a central conflict, and of all of the characters out there to have beef with Kingsley, the Urich makes sense (Norman Osborn would make even more sense, but I’m guessing Marvel is going to deploy one of its premiere “event” level supervillains in a three-part miniseries). Also worth mentioning in my praise of this issue is just how wonderful Rodriguez’s artwork is from start to finish. Rodriquez is best known as a colorist, but he provides both pencils and colors for this comic. His work definitely enhances the brightness and quick-paced nature of the narrative, making Rodriguez yet another creator who has done guest-spots on Spidey spinoff books over the past year that warrants consideration for a more regular gig in the Spider-Man sandbox. Anyone else notice the new Anti-Venom in the crowd scenes? I also see Maggot from the X-Men. And Razorback!